Advertising agency DDB Canada has used NFC tags and QR codes to encourage consumers to interact with a street art installation designed for the launch of the car maker’s 2013 Subaru BRZ sports coupe. SCORCHED: Subaru’s smartposters carry QR codes and NFC tags. Click to enlarge. NFC tags and QR codes have been integrated into a street art installation, designed by advertising agency DDB Canada, for the launch of the 2013 Subaru BRZ rear-wheel-drive sports coupe. The installation formed part of the Montreal Formula 1 Grand Prix weekend and used NFC tags supplied by Canadian firm TapMeTags to encourage consumer interaction with the installation, dubbed ‘Scorched’, on the city’s Boulevard Saint-Laurent. The installation saw the BRZ being showcased in a movie-style set featuring a burnt mailbox, singed bike rack, melted street lamp and a 32-foot heat-blasted brick wall. The result, says TapMeTags, “was a surreal replica of a Montreal street corner that appeared to have been utterly ‘scorched’ by the new sports car”. 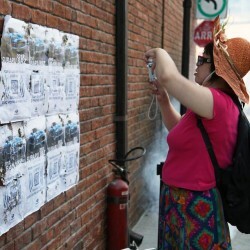 Dozens of singed smart posters, encouraging observers to ‘tap or snap’ using their NFC phones, completed the scene. “Consumers were then directed to a dedicated BRZ landing page whereby they could learn more about the vehicle, view images and book a test drive,” the tag supplier adds.